IKEA by night. Photograph: OiMax. Sometimes you find more at an IKEA than an Expedit bookshelf. Sometimes you find the food. IKEA is many things to many people. It’s a place to mark life events: welcoming baby with a sniglar or a hensvik, sending her off to college with best friends lack and billy, finding low-cost accoutrements for baby’s first 391-square-foot place. It’s a place to laugh at names like skänka and flärdfull and smörboll (which are sometimes insulting to the Danes). It’s a place to stock up on dishware and fantastisk napkins and adequate salad spinners. In China, it’s even become a blend of store and theme park, where customers feel free to take naps in the beds, cuddle on the model couches, and have deep discussions on the nooks and crannies of life. For others, it’s a grocery store. Now, “others” might be code for my shopping companion and I (and maybe a kindred soul in Tampa), who spent far too much (but surprisingly little) on a recent visit, buying two packages of lax najad (marinated smoked salmon), a package of lax varmrökt (hot smoked salmon), sill gräddfil (marinated herring in sour cream), silrom (herring roe), skarpsill (marinade anchovy-style sprat fillets), Kalles (creamed, smoked fish roe), several types of cheese (ost Herrgård, ost präst, Swedish-style fontina, and västerbottensost – a harder cheese with a delightfully sour complexion and a must-have for the late summer crayfish party), and six or seven bags of räkor utan skal (peeled, miniscule coldwater shrimp tasting strongly of the North Sea). Past visits have included jams – sylt hallon & bläbär (raspberry and blueberry jam), sylt apelsin & fläder (orange and elderflower marmalade), and the ubiquitous sylt lingon (lingonberry preseves) – and various mustards – senap grov (whole-grain mustard) and sås senap & dill (sauce with mustard and dill) to accompany delicious lax gravad. Then there’s the milk and dark chocolate bars, because who can resist. With no baskets in sight and no cashier at the market, we waited in line at the bistro cradling $80-worth of unpronounceable fish products. The other customers, waiting in line for their 50-cent hot dog looked horrified. Seriously, eyes as wide as färgrik dinner plates. 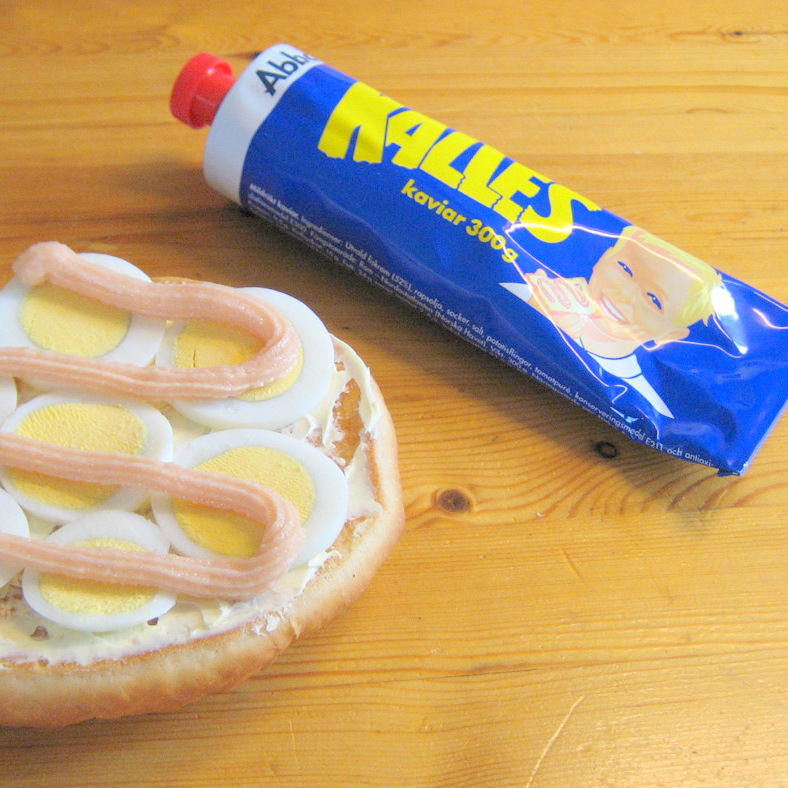 A really fancy smörgåstårta. Photograph: Mereman. IKEA’s relationship with food revolves, of course, around their meatballs. Visiting an IKEA without having them, after all, is like touring Stockholm and skipping Gamla stan, the Swedish capital’s historic center. It just isn’t done. The numbers bear this out. 150 million meatballs were served in 2013 alone, and the Wall Street Journal reports the store’s food division “is a behemoth, rivaling Panera Bread and Arby’s, with nearly $2 billion in annual revenue.” An estimated 700 million people ate in one of the chain’s 300 cafeterias worldwide last year – over twice the population of the United States. All because founder Ingvar Kamprad worried shoppers were getting hungry after hours of searching for the perfect table lamp. And so the store came up with a menu of salmon, roast beef, smoked reindeer steak, and meatballs. Just imagine reindeer as a holiday special across America. (Try the Rødålf. It’s delicious.) But members of the deer family can be pretty fun in Sweden. But IKEA’s food selection extends well beyond its meatballs. There’s the food market downstairs, with its orderly rows of jars and tubes and bags and boxes, over by the exit and just past the cash registers. There’s the knäckerbröd, which may be more fun to say than eat, and the frozen desserts. But then there are the weirder things. I couldn’t resist the Kalles kaviar, a cream of smoked fish roe, because I’m a sucker for packaging. The product comes in a toothpaste tube whose imagery hasn’t changed much in the half-century since it launched. It’s blue and yellow, naturally, with a stylized mid-century font and a cartoon of a creepily grinning blond child in a white t-shirt, apparently the son of the Kalles’s then-CEO. It’s been a commercial success since the beginning, a kind of a Swedish Vegemite or Marmite, beloved in its own culture but despised elsewhere – unbelievably salty with a fishiness unparalleled in standard American cookery – though the Swedes seem to think the rest of the world likes it, at least the Swiss, the Japanese, and the Hungarians. It seems to be most popular atop slices of hard-boiled egg and rye bread. And, because it’s Sweden, it’s manufactured by Abba – Abba Seafood, that is, which let the pop group share its name in the 1970s, so long as “the youngsters” behaved and did not “harm the [company’s] good reputation.” The company has since been merged with and sold off by Volvo. But what do you do with a refrigerator full of IKEA Swedish Market ingredients besides marvel at Kalles kaviar? People have long hacked IKEA furniture, turning the Expedit bookshelf into a swanky bar and the Pax wardrobe into a disguise for litter boxes. So why not hack the food too? 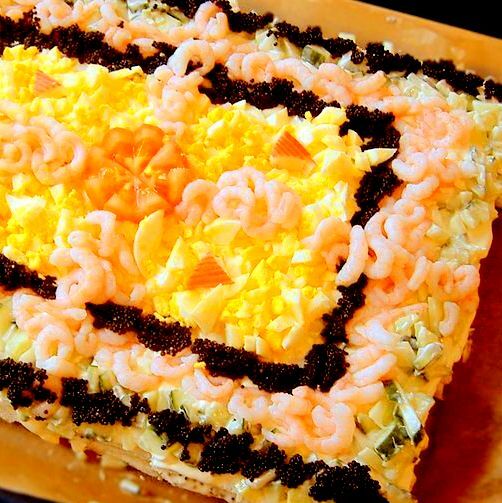 The smörgåstårta is a traditional, savory “cake” reserved for special occasions. (And, really, what’s more special than a trip out to the ‘burbs to run around IKEA?) It’s made from slices of white or light rye bread decorated with egg, mayonnaise, shrimp, fish roe, cucumber, cheese, smoked salmon, or whatever else makes you happy. (Can you imagine a more festive way to celebrate a friend’s birthday than with “Happy 30th!” written out in tuna salad?) The Kitchn posted ideas for a whole bunch of them a while back. But when it comes to the smörgåstårta, the only limit is your imagination (and maybe the inventory of IKEA’s Swedish Market). My own smörgåstårta, not as pretty but just as tasty. My companion and I took four pieces of white bread, toasted them very lightly, and removed the crusts, ensuring that the slices were of the same dimensions. We placed two of the slices side-by-side and spread a mixture of Hellmann’s mayonnaise, a healthy dose of sliced, fresh chives, dill, and paprika across them. On top of that, we placed a fair amount of the räkor utan skal – the peeled, small coldwater shrimp – along with finely-diced celery. (If the lax najad had been defrosted, I might have added that as well.) After spreading the mayonnaise mixture across the top and bottom of the remaining two slices of bread, we placed those slices atop the previously decorated slices, pressing down lightly. 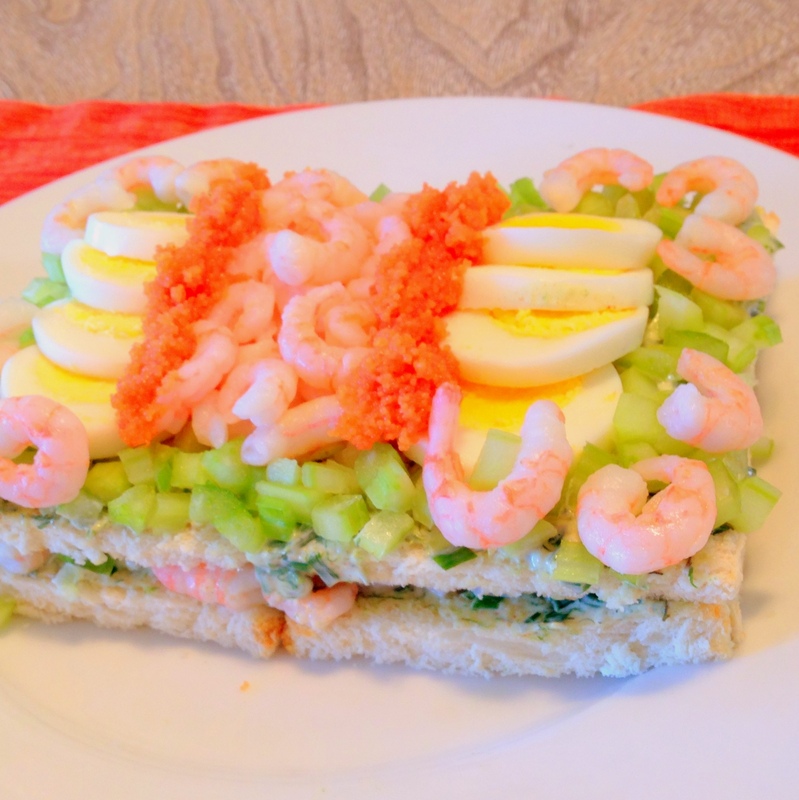 We outlined the top slices with the diced celery, placed a row of hard-boiled egg slices just inside the celery ring on either side of the smörgåstårta, and piled more räkor utan skal between them. On either side of the shrimp, we placed a thick row of roe – the silrom, the bright orange pearls of herring caviar. The dish would have been finished off with a few decorative squeezes of the Kalles kaviar, but I was warned in no uncertain terms by my companion that would not be permitted. 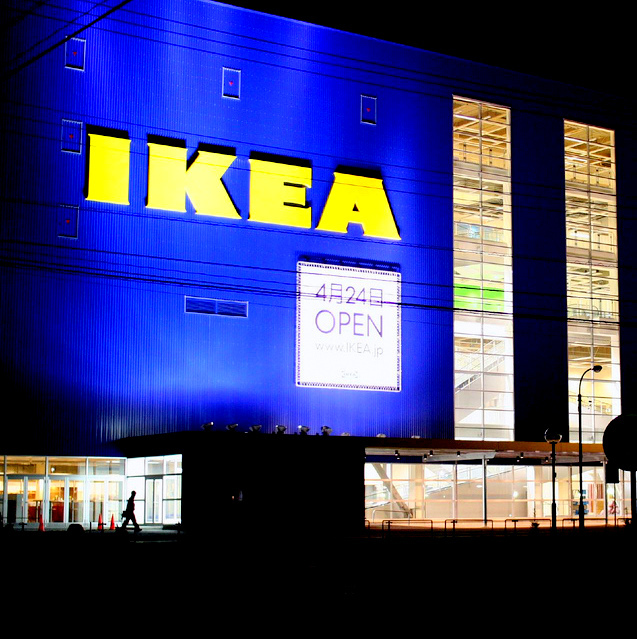 So next time you venture out to Woodbridge or Paramus or Burbank, skip IKEA’s furniture wonderland. Don’t lose yourself. Walk quickly through the massive store utilizing the well-hidden shortcuts if you can find them. Pass confidently – strong, tall, and upright – without a glivarp or dagstorp in tow, through the long lines of college kids at the cash registers, past the tantalizing bags of Swedish Fish, and make your way to the market. A whole endless wonderland of smörgåstårta awaits you.